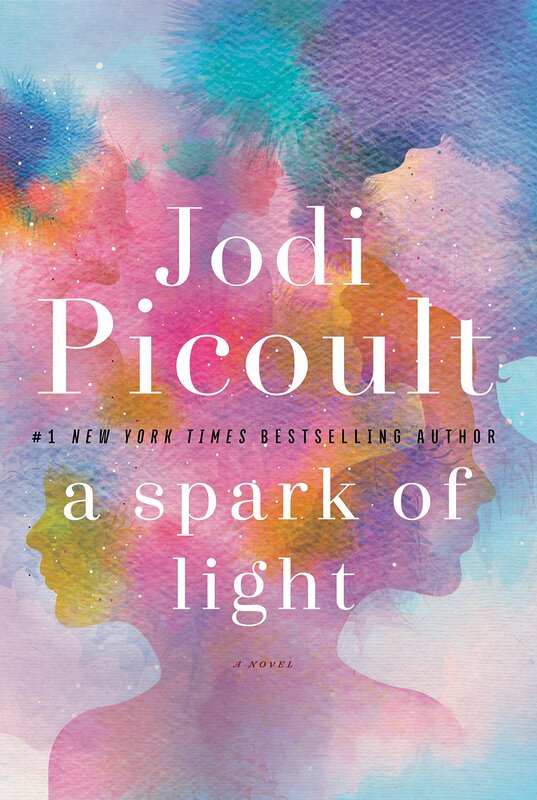 For years I’ve judged Jodi Picoult’s books by their covers. Often showcasing minimal photography covered with large type that’s mainly indicative of chic lit, I walked right past her shelf of novels, not realizing the true beauty I was missing. My recent appreciation for Picoult was not out of the blue…it came to me on a little cloud in the form of my sister, who has read not one, not two, but near 15 of Picoult’s novels. She gave me a long list of Jodi books to read that I’m STILL plowing through! The first Picoult book I read was Small Great Things, a gripping novel about the large racial issues that still plague our country. It was a captivating story that I was not expecting, as was My Sister’s Keeper, the second Picoult book I added to my repertoire. When my sister told me that Picoult would be coming to Milwaukee to promote her new book and do a talk, we knew we had to go! I didn’t know anything about A Spark of Light before going to Picoult’s talk. While I wasn’t surprised that Picoult decided to cover a hot-button issue in her most recent novel (abortion), I was pleasantly surprised with her candor. A genuine advocate not for woman, Picoult spoke with great respect about the women she interviewed who had recently had abortions, doctors she shadowed performing abortions, and the thousands of men and women who stood outside the clinics day after day trying to convince desperate women to change their minds. This book does not take sides, nor does it show one side in a better light than another. As Picoult says herself, there are times people can be on both sides of the argument, and that’s okay. If anything, that means that more and more people are open to understanding that abortion is and never will be a political issue…but will always be a human rights issue. The Center shines brightly in the little Mississippi town that houses it. A clinic that offers women help with birth control, pregnancy screenings, sensitive cancer diagnoses and yes, abortions, the Center is a refuge for women all over the south, including the 10 or so people that have arrived there for various reasons this warm fall day. However, in the early morning hours, a distraught gunman bursts through the door, opening fire and killing several patients, doctors and nurses instantly. The rest, including those severely injured, are held hostage. After Hugh McElroy, a police hostage negotiator, gets to the scene, he begins communication with the gunman inside. However McElroy’s job is made increasingly more difficult when he comes to learn that his sister and 15-year-old daughter, Wren, are among those still inside the clinic. Working back in time from the end of the hostage situation to the morning hours before the shooter stepped foot into the center, A Spark of Light slowly brings to life a cast of unforgettable characters, including a pregnant nurse who puts her fears aside to help others, a doctor who does his work honorably in spite of his own beliefs, a pro-life protester, a young woman who has just had an abortion, as well as a disturbed killer who will stop at nothing to seek his revenge. Fearless and thought-provoking, A Spark of Light tackles a complicated issue with decency and respect. It’s not about who’s right and who’s wrong, but more so about understanding. What does it mean to be a good parent? How do we balance the rights of a pregnant woman with the rights of the life inside her? At one point in the talk, Picoult asked the audience to raise their hand if they knew anyone who had an abortion in their lifetime…more than half of the audience raised their hands, including my sister and me. Many of us know – or are – women that have suffered through this. Most women don’t get pregnant hoping to have an abortion…for several women, this is a last resort, whether it’s for their own health or the life inside of them. This is not an issue that should divide a country, it’s an issue that should be talked about, understood and respected. If A Spark of Light does anything, it serves as its namesake, striking a match on a conversation, no matter how big or small, that might help at least one person better understand a woman’s right to make her own decisions. We’re a mere couple weeks away from Thanksgiving…and in the hustle and bustle of the holidays, it’s easy to forget the reason for the season. If you’ve just been on overdrive these last few weeks, take a moment and enjoy these gratitude quotes, pulled from a few famous authors and books. Use them on your Thanksgiving table or hang them on your wall as a reminder to be thankful for what you have, what you’ve learned and every little experience that has brought you here. After a good dinner, one can forgive anybody…even one’s own relations. I am grateful for what I am and have. My thanksgiving is perpetual…my wealth is not possession, but enjoyment.